This is the most common form of conjunctivitis. It is also very contagious. 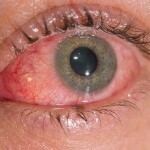 In viral conjunctivitis, there is watery discharge from the eyes. Caused by bacterial infections, it is also very contagious. Bacterial conjunctivitis may be characterized by a thick discharge from the eyes and crusting on the eyelids, especially in the morning. 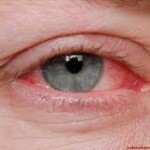 This type of conjunctivitis will cause eyes to be itchy, red and tearing. It is not contagious.